Is your toddler beginning to master the art of using the toilet or wanting to help out in the kitchen? Unless your countertops, sinks, and tables are lower than usual, they’ll need some help to reach. 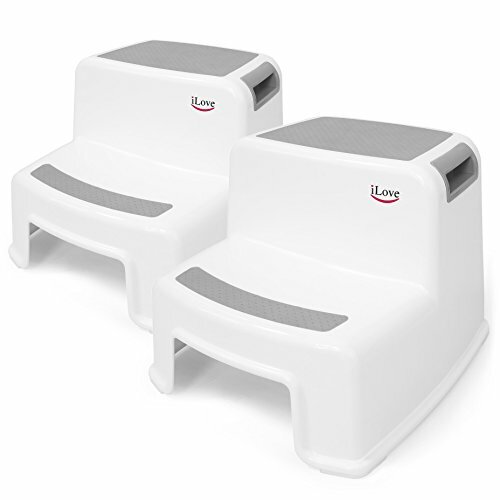 We’ve checked out the best toddler step stools on the market to help you out. This is an underrated item — I for one never thought of it until a friend spoke about how useful it was. Toddlers love to learn and help — but they also want to be independent (source). A step stool helps with both. With the right stool, those short arms can reach the bathroom sink and kitchen countertops. But as with all toddler products, we want to find the best out there — so that’s what we’re doing today. Let’s get started with what to consider when purchasing. Use the links above to check the latest prices or read our in-depth toddler step stool reviews below. A step stool becomes essential once your toddler wants to do things by themselves. This could be anything, such as going to the toilet alone, then washing hands afterward — experts recommend using them during toilet training (source). Perhaps they want to help out in the kitchen, making some cookies or decorating a pizza. 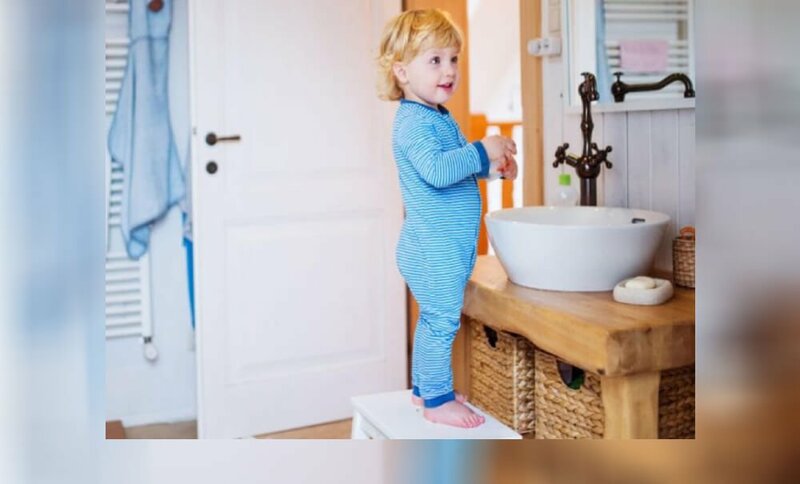 Either way, a step stool will give your toddler those extra few inches to reach new heights. Let’s go over a few features first, before you drop everything and rush out to buy one. Or more specifically, what is it that your toddler has to reach? There are all kinds of step stools out there. Some are a simple one step, others resemble a tiny staircase. For example, if your toddler has to use it to get on and off the toilet, a simple one step is enough. In this case, you don’t want something that’s too tall. This could ultimately leave your little one hunched over with their knees up to their ears. On the other hand, if the purpose is to use it in the kitchen, a taller step stool is essential. For your child’s safety, it’s crucial that the step stool never leaves them standing on their tiptoes. If it’s too short, your toddler will likely try to pull up on the toes and risk falling over. Your child is likely steady on their feet by now, but their balance is thrown off as soon as they step up on their toes. This could lead to an incredibly dangerous situation, especially if they go to the bathroom alone. Of course, if you’re handy, a great way to get the ideal step stool is to make one by yourself. When I purchased my first step stool, I dragged it around the house, following my toddler. It quickly became tiresome. So now, I’m passing my wisdom onto you. If you live in a bigger house or apartment, it’s probably better to invest in two-step stools. That way, a tall one can be in the kitchen and a shorter one in the bathroom. You won’t have to drag it around and it’s always there when you need it — problem solved. Another point I’d like to discuss is the width of the step stool. You should make sure it isn’t too narrow for your child to stand on safely, or too wide to fit in confined spaces. It’s ten times better to spend a few minutes searching for a measuring tape in your drawer than buying the wrong product that won’t fit your space properly, or isn’t wide enough to stand on. Now that I’ve shared some wisdom, it’s time for our top choices. While you’re looking, remember some of the above tips, including important safety features and more. Why do you need it, and where will you keep it? Believe it or not, finding the perfect step stool for your toddler can be a tricky task. However, this one seems to have everything. You’ll love this for two main reasons: it’s safe and sturdy. First of all, at the base, there are extra-thick rubber feet. These are slip-resistant and won’t cause any unfortunate accidents. The step stool is dual height. On the top step, your toddler will gain a whole 10.5 inches. The lowest step is a humble 5.5 inches. On the surface, you’ll find another layer of protection with non-slip rubber. This rubber is also super comfy to stand on and will surely be a favorite. Additionally, the steps are extra wide, so they can easily accommodate larger feet. This step stool can carry up to 175 pounds. With two per pack, you could even have one designated for you, and one for your child. Let the organizing begin. Adult-friendly, with a generous weight capacity. Some moms say that the top step is too tall for the toilet. When it comes to toilet training, it’s always helpful to invest in something that will make your toddler comfortable. During this time they learn how to go to the toilet, but also how to wash hands. 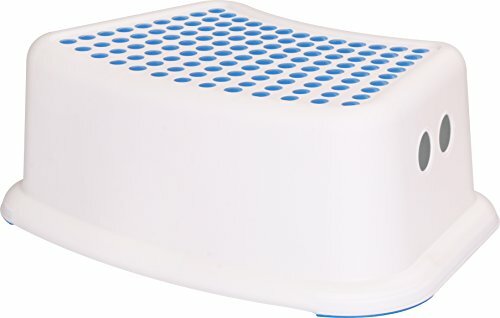 This step stool from Bumbo is just what they need. It doesn’t look like your everyday stool. It’s made to resemble an elephant’s foot — which is precisely where the company got the inspiration for the design. What we love is that it ticks all the boxes in terms of safety. There’s anti-skid rubber all over the surface and underneath the feet. It’s approximately 6.5 inches tall and 11 inches wide — just right for toilet training. It’s also lightweight and easy to move around. After your little one has finished their business, they can just pick it up and move to the sink, to wash their hands. However, with a maximum weight limit of 110 pounds, it won’t hold as much as some of our other choices. That said, it’s durable and steady enough for a wiggly toddler. Lightweight and easy to move around. Each purchase helps children in need. Some parents say it’s not quite tall enough for their toddlers. Splurging a lot of money on a step stool isn’t ideal. But it’s difficult to find one that’s safe, eco-friendly and affordable. This one looks similar to many others, but one thing that’s different is that it’s made from environmentally-friendly material. This Utopia Home product is constructed with multiple layers of polypropylene plastic. This will also make it odor-resistant, which is a huge plus if you move it from room to room. The surface is covered in anti-slip grips to prevent little feet from slipping. We love the simplicity of the step stool itself. You can choose between two color combinations — white and green, or white and blue. The stool is highly portable, weighing less than a pound. It has a generous width of 14.5 inches, but it’s quite low, measuring only 5 inches high. Weight limit of 70 pounds. Sometimes a single height step stool is not enough, especially for younger toddlers. This dual height model from California Home Goods is just what you need, and in this offer, you’ll get not one, but two. The step stool features two steps — the highest is 10.5 inches and the lowest is 5.5 inches. With this combination, even the shortest toddler will be able to reach the sink. Each step’s width is approximately 11.5 inches, with a total depth of 14 inches. We also love the BPA-free material. There won’t be any toxic plastic near your little one. 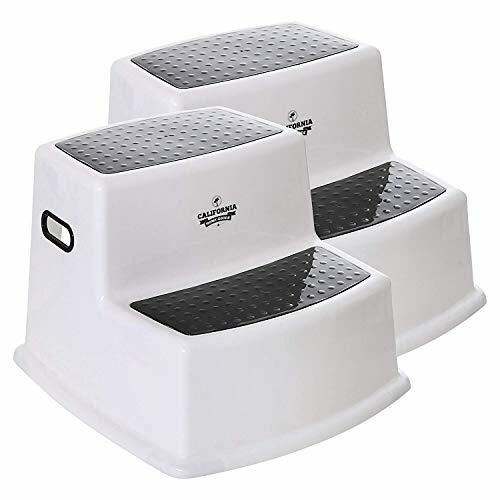 The step stool also has the standard non-slip safety features both on the surface and base. The surface of the steps is slippery if it gets wet. Toddlers are often eager to get involved, especially in the kitchen. But it’s not always easy finding a place for them to stay safe while still being able to help. 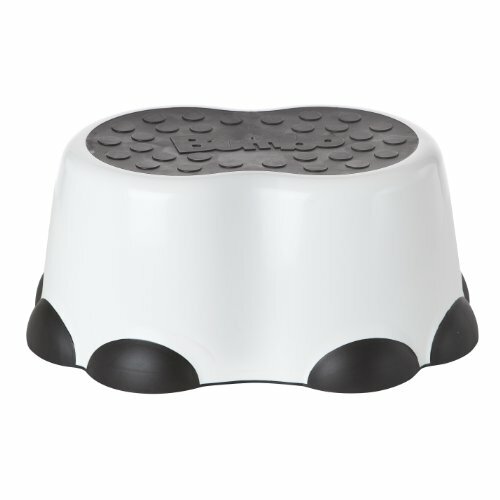 Luckily this step stool from Guidecraft is an excellent platform during cooking time. Because it’s rather large and bulky, it’s best to keep it in the kitchen. One invaluable feature is the adjustable platform where your toddler will stand. The highest point is 17 inches, but as your little helper grows taller, you can easily bring the platform down to 14 inches. Several colors are available, to coordinate with your kitchen decor. On the top step, there’s plenty of room to move around, with a width of 17 inches and 20.5 inches deep. Additionally, there’s a handle on each side, which your toddler can hold onto while climbing up or down. Wide and adjustable height platform. Can even hold mom or dad, up to 200 pounds. Difficult to store due to shape and size. Boys will forever be boys — they’re always on the go, looking for the next adventure. Now your little explorer can bring his imagination into the bathroom. 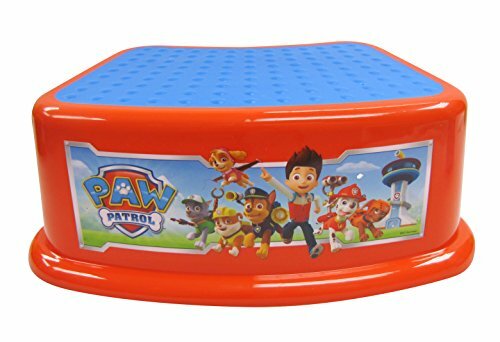 This lightweight step stool from Nickelodeon is excellent for toilet training boys. Your toddler will love the “Paw Patrol” theme. Everything is blue and red with stickers from their favorite show. What’s more, the stool is durable. It’s made with extra thick materials and can hold up to 200 pounds. There’s a non-slip rubber surface that can be removed for efficient cleaning, and the feet have non-slip rubber pads for additional safety. However, at less than five inches tall, it seems that the stool is a little too short for smaller users. Non-slip rubber on surface and feet. On the short side, so some toddlers might be unable to reach the toilet or sink. Toilet training or helping out in the kitchen has never looked so cute. 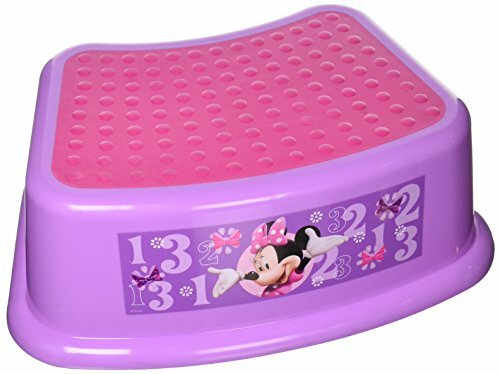 This easily transportable step stool from Disney is all Minnie Mouse inspired. Your toddler will love the bright colors of pink and purple. Plus the large Disney sticker at the front will be the cherry on top. The step stool is just over five inches high — it’s not the tallest, but good for toilet training. The shape is even curved to fit as close to the toilet as possible. Disney hasn’t compromised on safety. The material is strong and sturdy, and the stool can support up to 200 pounds. Both the surface and feet have rubber to keep the step stool secure. Although durable, it’s still lightweight enough for your toddler to lift and move from toilet to sink; it weighs a mere one pound. Cute Disney theme for girls. Safety is, of course, a top priority, especially when it comes to our babies. Toddlers often act as though they have ants in their pants — wiggling or jumping. Fortunately, most step stools for toddlers do come with the following safety features. Non-slip surface: This is important as it keeps your toddler from sliding off. You can find this on the top surface where they place their feet. It’s generally some type of rubber — some can be difficult to keep clean, but they’re worth it. Non-skid feet: Yes, toddlers wiggle, a lot, and the stool may glide under their feet, sending them crashing to the floor. The non-skid feet are the same concept as above, they’ll keep the stool from slipping away. It’s crucial to avoid placing the step stool near to the stove, any hot plates or propane gas. Sharp or fragile utensils and devices should also be well out of reach. Little hands are like lightning! Here are some additional tips on keeping your little one safe while helping out in the kitchen. Here are some additional tips and things to avoid. Some are due to safety concerns while others are more for convenience. Avoid a folding step stool: They can be dangerous, with hinges and narrow spaces just waiting to trap those little fingers. Your toddler might also try to copy you and fold the stool, and get their fingers caught — ouch! Multiple users: I know this is for toddlers, but what about that cabinet you can’t reach? Wouldn’t it be great to have a stool you can use as well? Talk about getting your money’s worth. Portable: Remember my advice earlier to perhaps invest in two-step stools? Well if you can’t afford this (I know I couldn’t), then find one that’s easy to move around. Carrying around a heavy wooden step stool up or down stairs is no fun, especially if you’re also carrying a toddler! 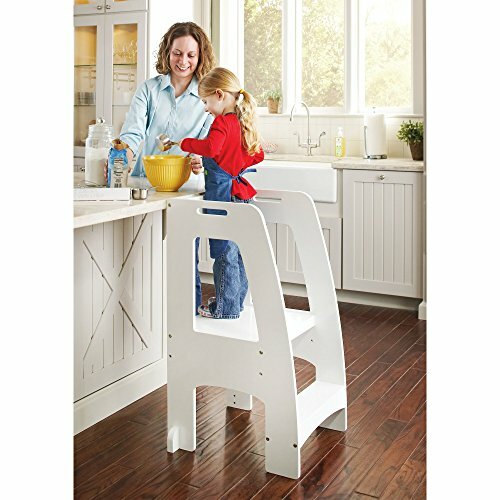 Toddler step stools are excellent to have around the home, not just in the bathroom. They help your little one feel more independent when it comes to toilet training or helping out in the kitchen. That said, it’s essential to find one of durable material with the right safety features, like a non-slip surface and base. That’s why my favorite is the iLove step stool for kids. It’s durable and safe, while the two steps help your toddler reach the right height. Furthermore, being adult-friendly and having the advantage of two in a pack, we feel it’s a great all-around deal. We hope that you enjoyed our list. If you have a favorite step stool, feel free to tell us below. And make sure you hit the share button before you leave.